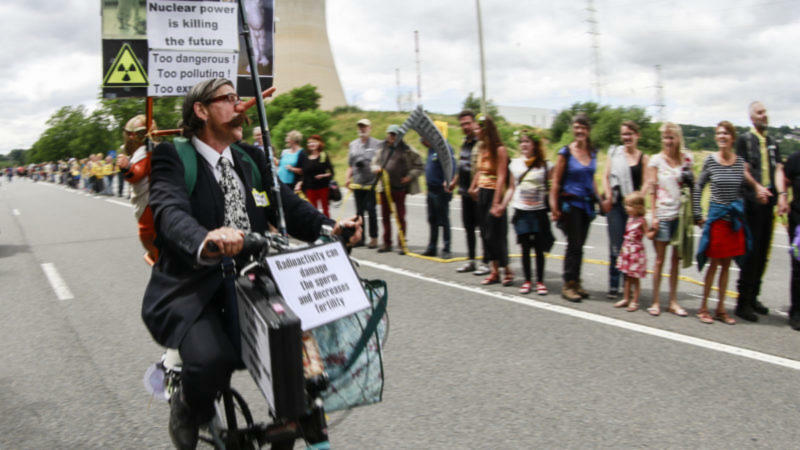 The protesters called for the “immediate” closure of two of Belgium’s nuclear reactors, including Tihange’s reactor 2 and the Doel facility’s reactor 3, which lies on the northern border with the Netherlands. According to organisers, 50,000 people turned out to form a human chain that stretched 90 kms from Tihange, in east Belgium, to Liège, the Dutch city of Maastricht and the German city of Aachen. Both reactors in question were restarted in 2015 following a hiatus of more than two years after micro-cracks were detected in both facilities. The decision was made following extensive investigations and consultations with international experts. The lifespans of Doel’s other two reactors, 1 and 2, were controversially extended in mid-2015 by ten years. Both were meant to go offline that year and will instead keep running until 2025, when they will celebrate a half-century of operation. Nearly 40% of Belgium’s total energy needs and 55% of its electricity are satisfied by nuclear power and its reliance on its ageing nuclear stock will continue as it pursues other energy sources. But experts recently detected 70 new fissures within Tihange 2, after using ultrasonic technology, according to Belgian Interior Minister Jan Jambon. Jambon insisted that the power plant’s security is not in doubt and it will continue to operate. Doel 3 was also found to have micro-cracks back in November. The government said that reactor would also continue to operate. The organisers said on their website that “it is incomprehensible and unacceptable that the government leaves these reactors on”. It is not just the state of Belgium’s reactors that has angered protesters. Its seven reactors are all at least 30 years old and three of them are 40 years old. Japan’s 2011 Fukushima disaster convinced Germany to begin phasing out nuclear power and in early 2016, Environment Minister Barbara Hendricks called on her Belgian counterparts to “temporarily” take the reactors offline due to unresolved safety concerns after hydrogen flakes were detected in both. Hendricks failed in that bid but both governments did eventually agree to a better exchange of information on all things related to nuclear power. It is unclear how these fresh concerns about the state of the Tihange facility will affect Brussels-Berlin relations, especially given Hendricks’ disappointment with last year’s agreement, which “did not meet all the needs and expectations of border communities”. A European Court of Auditors report last year found that the decommissioning of a number of Soviet-era nuclear reactors within the EU is significantly behind schedule and that billions of euros are still needed to complete the job. Decommissioning eight reactors in Lithuania, Slovakia and Bulgaria was part of those countries’ EU accession deals but the process is still ongoing. The strongly-worded report recorded a number of shortcomings in terms of know-how and potential improper use of EU funding. One nuclear power plant in Lithuania has the same type of reactors as Chernobyl, the infamous Ukrainian facility that failed and caused a massive disaster in 1986. It is the first time that a graphite reactor will have been decommissioned, although the initial shutdown date of 2029 has now slipped to 2038. 40% of Belgium’s total energy needs and 55% of its electricity? That implies a very low use of fossil fuels for transport, heating and industrial processes. Source please, or even better, a Sankey chart. Belgium’s atom power profits don’t exist.